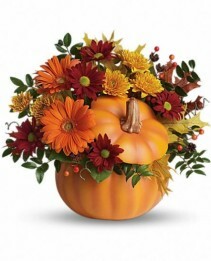 jack-o'-lanterns, trick-or-treating, and lots of Halloween decoration themes and activities to enjoy. 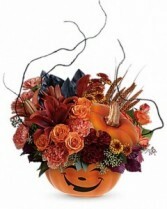 Flowers By Mary Lou of Springfield, is a great place to start for creative suggestions on Halloween party decorations. Let us suggest some Halloween floral themes and Halloween party flower ideas for kids, and maybe even a few tips grownup 'ghouls' will like too! 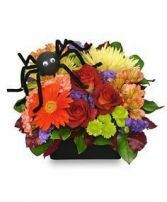 Give your Halloween festivities a 'frightfully' fantastic look and feel with colorful flowers and fun Halloween floral decor. 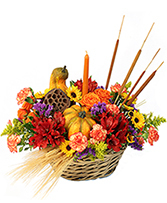 This colorful flower arrangement from FLOWERS BY MARY LOU INC is a great choice for Halloween and Harvest decorating themes. Seasonal accents like miniature pumpkins give it a special touch of fall festivity! 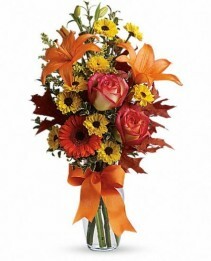 A burst of beauteous blooms in autumn shades of orange and yellow is mixed with a handful of oak leaves, then delivered in a clear glass vase adorned with a bright satin ribbon. 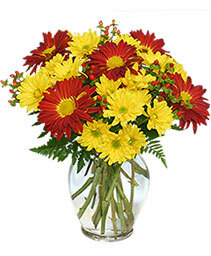 A splendid gift for birthdays or any fall occasion. 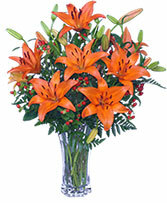 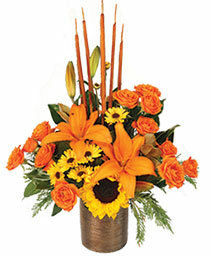 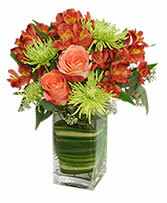 •A mix of fresh flowers such as Asiatic lilies, Viking spray chrysanthemums, roses and a miniature gerbera - in shades of orange and yellow - is arranged with preserved oak leaves in a clear glass vase adorned with an orange satin ribbon. 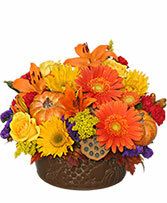 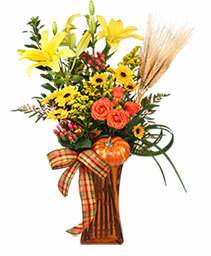 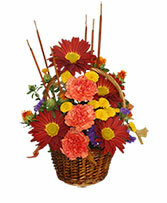 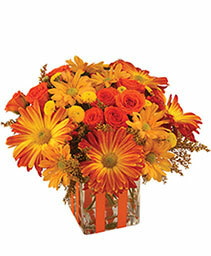 October Offerings from FLOWERS BY MARY LOU INC is a great choice for Halloween and Harvest decorating themes. Accented with dried wheat, mini pumpkin and seasonal ribbon, this flower arrangement beautifully captures the essence of fall!